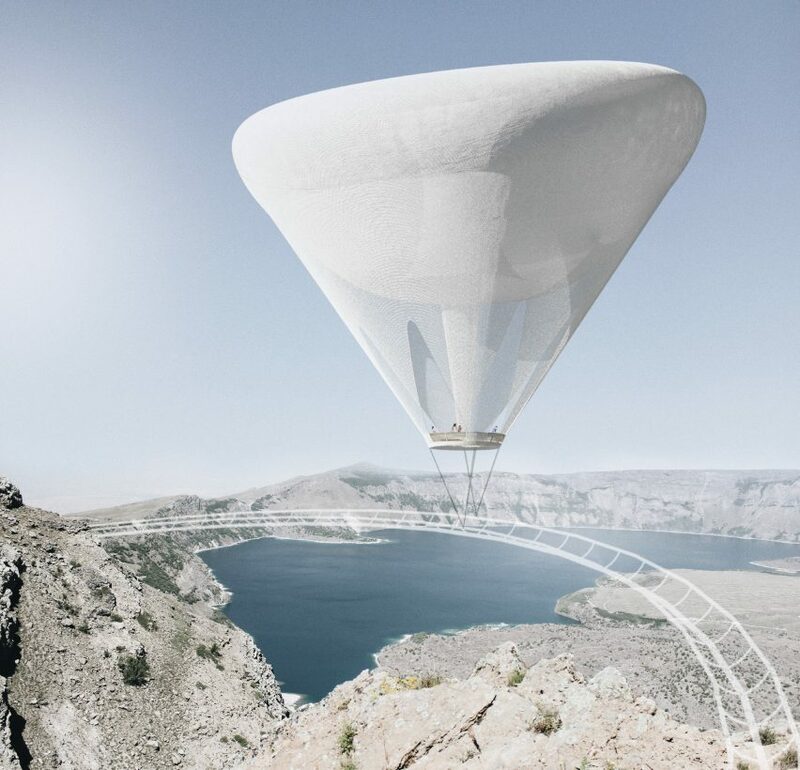 A helium balloon tethered to a cantilevered track is among the winners in a competition to design a conceptual observation deck to overlook a volcano’s crater in eastern Turkey. The Volcano Eyes competition, which was held by Bee Breeders, set entrants the challenge of designing a 20 square-metre observation platform to perch at the top of Nemrut, a dormant volcano situated in eastern Turkey. Sitting at an altitude of 2,800 metres, the viewing deck would provide uninterrupted and otherwise unaccessible vistas of the surrounding scenery and the volcano’s large, crater-like pit that plays host to three lakes. 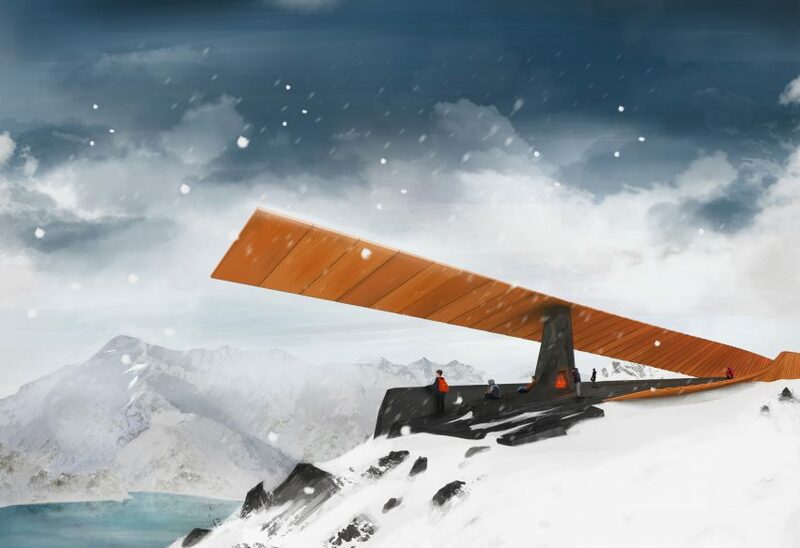 While the projects won’t actually be realised, participants were asked to develop their ideas using a guide budget of £75,000 and to keep in mind that the site will be reachable via a ski lift. Due to the remote and largely untouched location, designs were also expected to consider energy efficiency and environmental responsibility. First prize was awarded to students Fernando Irizarry, Marcos Ortiz and Gabriel Rivera from the University of Puerto Rico, whose project aims to “change the idea of a static observatory”. They proposed attaching an asymmetric helium balloon to a circular railed track, along which it would slowly move to offer 360-degree views of the landscape. Jutting out over the peak of the volcano, the rail’s limited anchor points mean that little impact is made at ground level. The second prize was given to architect Keremcan Kirilmaz and product designer Erdem Batirbek, both from Turkey. Their project features a stepped walkway that would ascend to a viewing platform shaped to reference the flow of lava and shifting movement of tectonic plates. Crafted from weathered steel, the structure has been designed to endure the setting’s changeable weather conditions. Architects Guiseppe Pastonesi, Desislava Georgieva, Marchela Varbanova and Nina Gerosa from Italian studio S64 scooped third prize for their triangular proposal (lead image). Cantilevering 10 metres over the edge of the volcano’s crater, the platform lets visitors sightsee from numerous different points. While the structure’s floors have been designed from meshed steel to allow glimpses of the land below, its exterior would be constructed from white metal plates so that it would be camouflaged against the terrain during the snowy winter months. Designers Sam Naylor and Elaine Stokes from the US were bestowed the competition’s BB Green Award that commends a project that has a particular focus on sustainability. Their observation deck, which gradually moves 70 degrees to offer different perspectives of Nemrut, is accessed via a solar-powered illuminated path. Architecture magazine eVolo host a competition every year to design a conceptual skyscraper. Previous winners have included a collapsible building that can offer relief in remote disaster zones, a high-rise containing 11 different landscapes, and a tower housed within the hollowed-out trunks of giant sequoia trees.